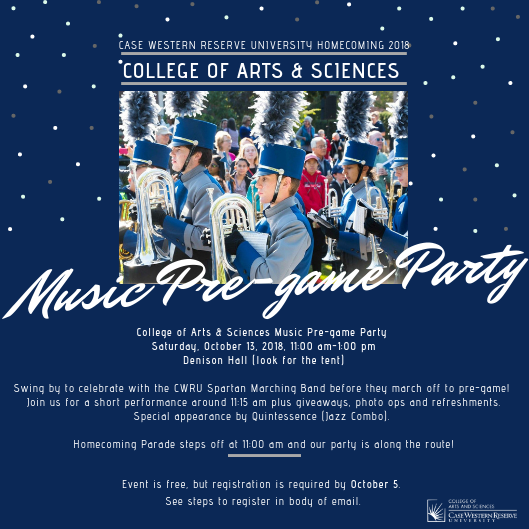 Celebrate during our College of Arts & Sciences Music Pre-game Party, Saturday, October 13, 2018 (11:00 am-1:00 pm) with refreshments, games, photos, giveaways, and special appearances by the CWRU Marching Spartans and Quintessence (Jazz Combo). This event is free, but registration for Homecoming is required (click here). Take a break from the pre-game party to join current students, families, and alumni for a BBQ lunch in Leutner Dining Hall. The Spartans take on the St. Vincent Bearcats (kickoff at 1:00 pm). Homecoming royalty will be honored during the halftime show. The Symphonic Winds and Spartan Marching Band will perform their annual Homecoming Concert at 3:00 pm on Sunday, October 14. This performance is part of the Maltz Performing Arts Center, Silver Hall Concert Series. It is free and open to the public, but registration is required. Reserve your tickets here. Parking passes may be purchased in advance for a nominal amount. Paid parking available upon arrival in the MPAC lot. Livestream here. Join us again on Monday, October 15 at 7:30 pm for a performance by the Case/University Circle Symphony Orchestra and Camerata Chamber Orchestra.